Chai wallahs stand on nearly every street corner in India, serving their unique brand of tea made of spices, tea leaves and milk. Their recipes are often secret, and many Indians go to their favorite vendor for years. In the first picture, Bansi, a chai wallah near the High Court in Mumbai, hands a cup of chai to a customer. 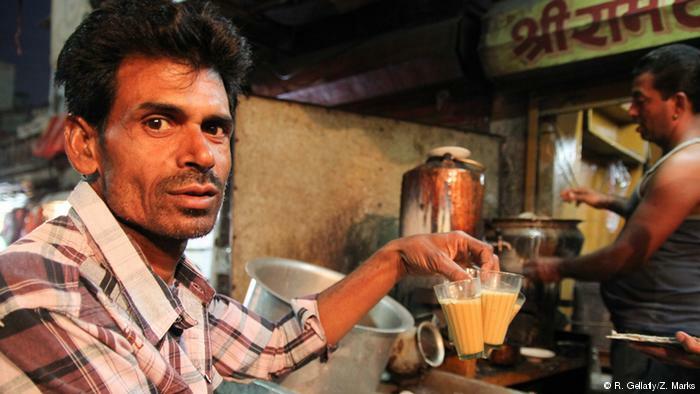 Mahinder serves chai to customers at Sri Ram Tea Stall outside the entrance to Clock Tower Market, in Jodhpur, Rajasthan. He is part of a three-person team at the stand: Rasa makes chai, Haresh brings it in paper cups to shops in the market, and Mahinder hands glasses of tea to customers at the stall. His claim to fame is being able to hold four cups in one hand without spilling a drop. 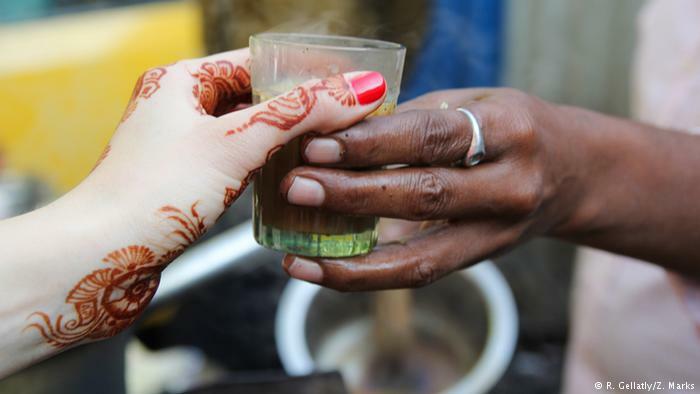 Meenakshi makes chai outside of a modern shopping complex in Kolkata, West Bengal. 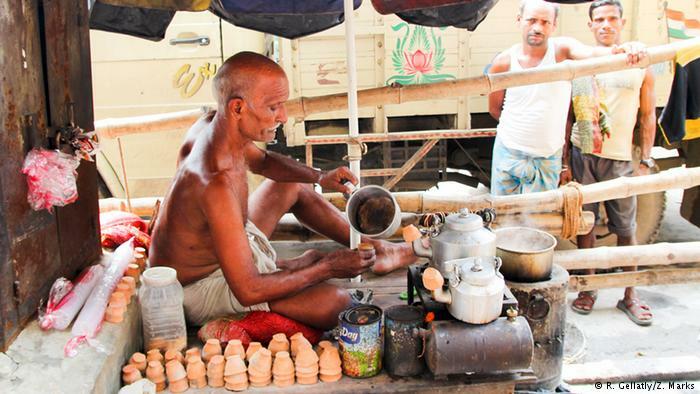 She represents a strong tradition of Bengali chai wallis, or female tea vendors. She often runs the stall single-handedly while her husband tends to their four-year-old son at home. For most of his 73 years, Shivnat Rai Jadav tended a herd of cows and buffalo in Kolkata’s Bara Bazaar. 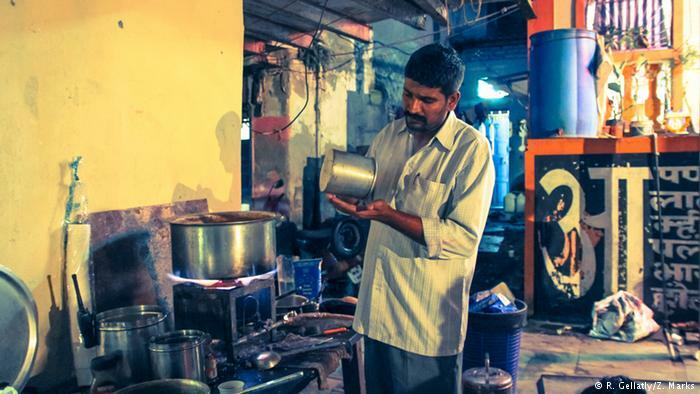 When forced to move his herd outside the city 10 years ago, Shivnat took up a new profession, using his milk to brew thick masala chai in the city. His sons still care for the herd in the fields and deliver fresh milk daily. His special recipe has no water in it, just milk. 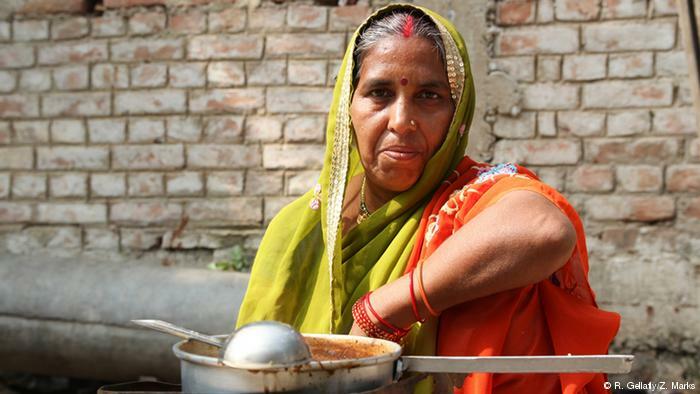 On the banks of the Ganges River, Sunita Devi runs a small chai stand. She sits on a wooden pallet raised just off the dusty paved road and sells chai, biscuits and tobacco to captains of the wooden boats that ferry passengers across the river to Diara, a popular picnic spot. Sunita sells around 200 cups of chai per day at five rupees per cup. That’s a daily income of around 12 euros ($16.33). 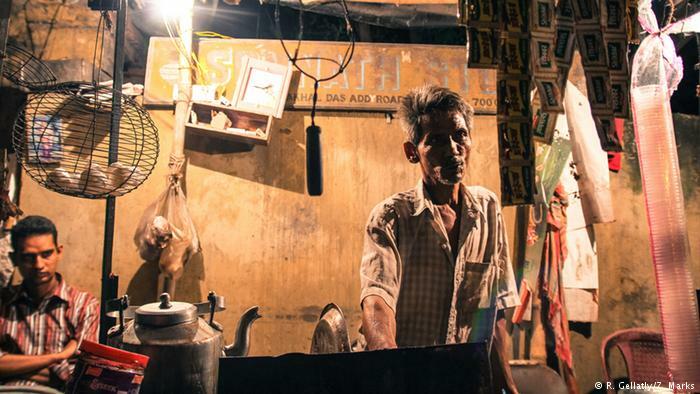 Shobhan Barwa’s chai stand sits in the heart of Alipore, Kolkata. He usually closes shop around 10 p.m., but during the week of Durga Puja, the city’s biggest festival, Shobhan stays open until 5 a.m. On these late shifts he serves chai and French toast to celebrants who need a caffeine kick to keep them going through the night as they visit the festival’s pavilions, called pandals. 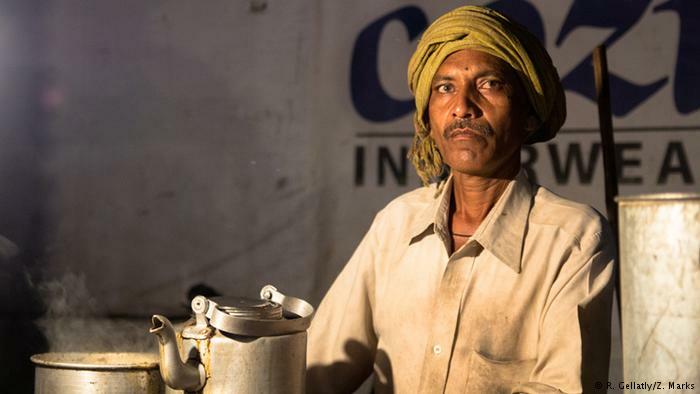 Ganesh, a chai wallah at the train station in Patna, Bihar, brews his last pot of the night. His hut, bright blue with flower garlands adorning the front, is identical to the adjacent chai stand. But Ganesh and his neighbor, Shubhilal Yadav, don’t see each other as competition. They view their proximity as a strength: It allows them to serve rushed commuters at twice the speed. 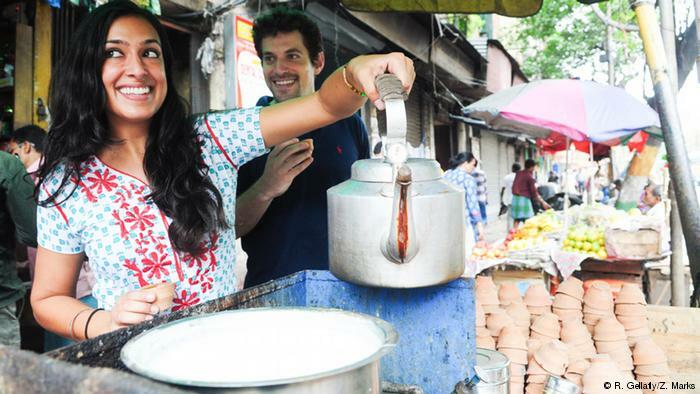 American journalist Resham Gellatly (left) and Zach Marks (right) got to know their first chai wallahs while living in India in 2010-2011. 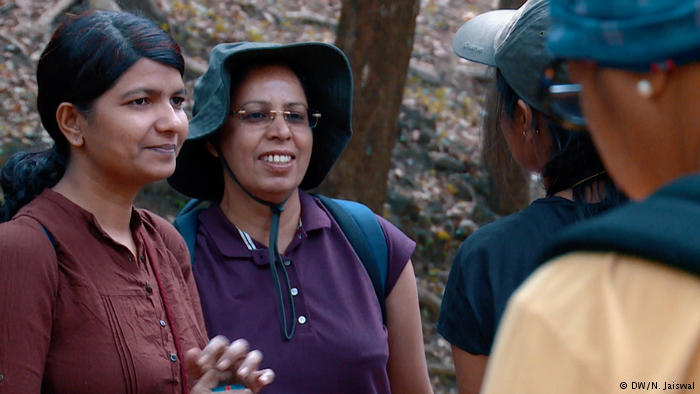 Fascinated, they returned to the country determined to collect and tell chai wallahs’ stories from around the country.